VisiLibity1 is a free open source C++ library for 2D floating-point visibility algorithms, path planning, and supporting data types. It is intended for use in robot and sensor network design software. Other possible applications include, e.g., manufacturing, facility location, architectural/urban planning, games, and education. The entire library consists only of a single compilation unit (one .hpp + one .cpp file) with no dependence on 3rd party libraries. 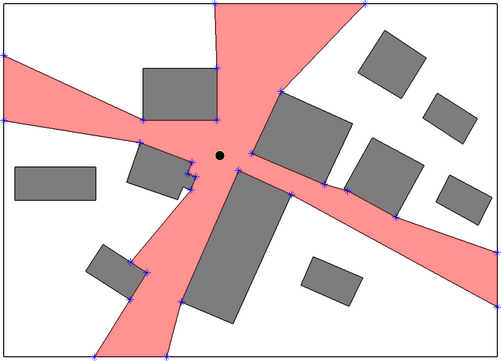 It is therefore suitable for applications where simple visibility and path planning computations are needed but the power of a larger computational geometry library is not necessary. Exact/arbitrary precision arithmetic is avoided and robustness is achieved by considering two points to be colocated whenever the Euclidean distance between them is less or equal to a user defined tolerance ε called the robustness constant. If the robustness constant is chosen poorly or the scale of environment features varies too dramatically, library functions can and will return errors. However, provided the user tunes the robustness constant appropriately, we find the library works well for a large range of useful environments. 3. Link your program with visilibity.cpp when compiling. Here is the source code documentation. >>> dir(visilibity)  # Ta da! See more instructions on running a demo at Yu Cao's repo. I've never used these bindings beyond confirming that the demo works, so I can't answer questions about them. However, if you have information you would like to share, esp. how you overcame difficulties, let me know and I can post it to the FAQ or contributions notes. See constributions list below to download the SWIG interface. I've never used these, so I can't answer questions about them. However, if you have information you would like to share, esp. how you overcame difficulties, let me know and I can post it to the FAQ or contributions notes. MEX files are included in `src/` on the main GitHub repository. See contributions list below for notes on use under Windows. To report a bug/bugfix or ask a question, send me an email with subject line of the form "VisiLibity1: ...". This project is entirely volunteer work and I have many other demands on my time, so please forgive slow responses. Be sure to check Frequently Asked Questions before emailing a question. Any other comments you have are also very welcome, e.g., on what your application is, overall architecture of the library, or possible future functionality. evaluation of transcentental functions is approximate. More details on problems associated with floating-point arithmetic can be found, e.g., in ``What Every Computer Scientist Should Know About Floating Point Arithmetic". "...fast floating-point hardware has become a de facto standard in every computer. If we can make our geometric algorithms robust within machine arithmetic, we are assured of the fastest possible implementation..."
To achieve robustness using floating-point arithmetic, VisiLibity operates using a technique called ε-geometry (AKA interval geometry) in which geometric primitives are fattened by very small amount ε. This involves the use of fuzzy comparisons in which equality tests such as x==y are replaced by fabs(x-y) ≤ ε. When using VisiLibity, ε should typically be chosen somewhere between machine epsilon and the smallest dimension of any feature in the environment geometry at hand. VisiLibity1 was developed originally as part of research funded by NSF award 0626457 and ARO award W911NF-05-1-0219. VisiLibity is licensed under version 3 of the GNU Lesser General Public License. Here are some other software packages you may find useful, though none of these are officially associated with VisiLibity.